GEORGE O’TOOLE: My project is called Rally for Recovery (R4R). R4R was sponsored through The Substance Abuse and Mental Health Services Administration (SAMSHA) and developed as part of Recovery Month. The goal of the rally is to give a voice to people in recovery and show the public and those currently in recovery or on the cusp that treatment does work and recovery is possible. At the rally, we have entertainment, speakers, local and federal politicians, and local musicians. We also give out awards and recognition to a person in recovery who has really had a positive impact on the community. Originally, R4R was put together through the RI Department of Behavioral Healthcare, Developmental Disabilities, and Hospitals (RIBHDDH) but in 2016, it was decided that R4R should become a community-sponsored event. So, I decided to make R4R a part of my project for CU. CU: What are the next steps in your project? GOT: This April, we shall be hosting an event where we will be honoring Rally 4 Recovery’s biggest donor to date, Home Depot. In May, we are also planning a cookout for our volunteers. They just work so hard to help us put on the rallies that we really cannot thank them enough. CU: A few weeks ago, something happened with your parole status. Can you talk to me about what happened that day in court? GOT: Sure. Due to my past addiction, the State of RI has been connected to me, either through probation, incarceration, or parole, for many years. I have never been “free”, as I like to say. Once I found recovery, I was granted unsupervised probation. I didn’t have to check in or call; all I had to do was notify them if I moved. About a month ago, I was informed that RI passed a law that said if you were on unsupervised probation for three or more years and met 10 other criteria, you could petition to see a judge about releasing you from your probation. So, I did my research, went through the process, and I got a court date. When I got into the courtroom, there were 11 other petitioners ahead of me. The judge worked his way down the list until he got to the last four of us. He said, “I have a problem with these four people.” I’m standing there, as one of the four people, getting nervous! The judge made his ruling on the three people ahead of me and then it was my turn. He looked at me and said, “I’m going to deny you but I will give you the opportunity to change my mind.” I started telling him my story about recovery, talking about my work with Anchor, and how I’m pursuing my education at College Unbound. Then he said he recognized me and he was right. I had done a forum with that same judge a few months ago. He asked for my packet where I had collected all of my work and character letters, one of which was written by [College Unbound Academic Provost] Adam Bush. I had letters from the probation officers, police departments, and my supervisors at Anchor. The judge read every letter out loud and then, after sitting back for a minute or two, said, “In all my years, no one has ever come into my courtroom with such a powerful packet. I have to take all of this into account. I do know what you do around the state. You’ve truly changed my mind. I’m impressed. I’m going against the Attorney General and I’m granting your petition.” I had 11 years left on my probation and he just wiped it out! The first thing I did when I left the courthouse was look up to the sky and thank my mentor Jim Geller and my mom. CU: How did your learning at CU help you in that situation? GOT: When I first started CU, I was not a great communicator. I could talk for a few minutes, but then I’d be rattled with nerves. Being at CU, doing the exhibitions at the end of every term, I gained confidence in my communication, planning, and advocating for myself. I don’t have that fear of communicating with people anymore. The classes have made me better, not just as a person, but as a supervisor as well. In a traditional college, I don’t think I could have had the success that I am currently having. The support is just invaluable and they’re always there to help us and guide us through our mistakes. The work I’ve done here at CU has also allowed me to ask for help, which sounds weird, but I’ve become teachable because I am open to getting help and recognizing where I might need help. CU: How did you come to College Unbound and how has being here affected your life? GOT: I was a chef and I ran two restaurants. In my spare time, I also volunteered at Anchor Recovery Center. 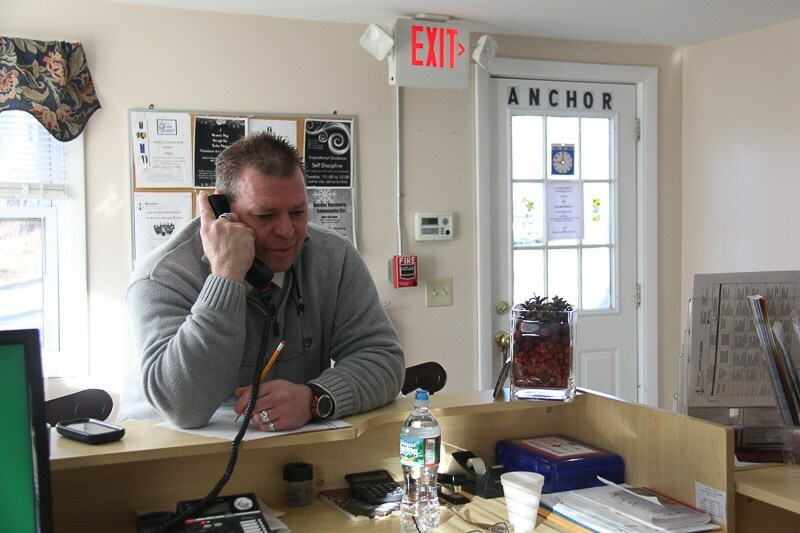 Through volunteering, I became friends with a lot of the people who worked at Anchor. They invited me to apply for a part-time job there. I applied, and got the job. A few months later, they offered me a full-time job. I accepted that offer and quit the restaurant business. My supervisors started talking to me about advancing my career and how I would need a bachelor’s degree to be promoted. So, I applied to Rhode Island College (RIC). I had worked with a few professors from RIC on the issue of recovery so I felt like I had a good foothold there. I got accepted to RIC, but, as I was going through the class schedules to choose my classes, I noticed that all the classes I needed happened during the day. Also, it turned out that RIC wouldn’t accept any of my older credits from the Community College of Rhode Island (CCRI). So, I went looking for another institution. I had heard about CU by word-of-mouth so I decided to check them out for myself and, once I did that, I decided to apply. Since joining CU, I was offered, and accepted, a management position at Anchor Recovery Center. CU: In the spirit of giving back, is there a peer or advisor or staff member who has really helped you since joining CU? GOT: [Assistant Director/Lead Instructor of CU's Prison Work] Kaiya Letherer was phenomenal. In my early beginnings at CU, she was always there. She helped me, accepted my emails at all hours of the day, encouraged me, and guided me through the assignments. Her dedication to helping people and teaching people is far and few between. I couldn’t really have reached where I am today without her help and guidance in the early stages. I had to put that “she’s a female, I’m a male” thing aside and realize that I am here to grow and she is here to help me. Also, the math tutor that we had was so incredibly helpful. Her patience and guidance and teachings were really helpful in understanding the harder parts of the course. CU: Is there anything else you’d like people to know? GOT: If you would like to donate to R4R, go to R4R.com and click the donate button. We will also be putting on several smaller rallies in Bristol and Newport counties, and inside the prisons here in Rhode Island.